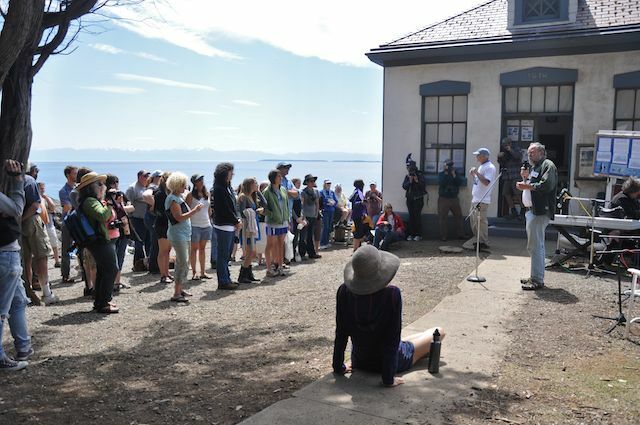 This weekend at Lime Kiln Point State Park the Center for Whale Research hosted a party in honor of J2 Granny, who is estimated to be 100 years old this year. Of course they don't know exactly when she was born, but they appropriately chose to celebrate on July 2nd - get it? One interesting thing Ken explained was how they arrived at 1911 as the estimated birth year for Granny, something I had always wondered about but a story I had never heard. I guess they had photos of both J1 Ruffles and J2 Granny in 1971 and both were already full grown adults. Since orcas reach full size around the age of 20, they made the estimated birth year for J1 Ruffles as 1951 (1971 - 20 years). Due to the way Granny and Ruffles associated with one another, they suspected that she might be Ruffles' mother. Since Granny was never seen with a new calf since the study began, they assumed she was post-reproductive, and that perhaps Ruffles was her last calf. Females generally stop reproducing around the age of 40, so if she had Ruffles when she was 40, her birth year would be about 1911 (1951 - 40 years). Clearly, there are a lot of assumptions in place here. Ruffles could be even older than we suspected if he had already been an adult male for a while by 1971. Granny may not be his mother; for example, we have seen J8 Spieden become the apparent adopted mother of L87 Onyx. If the studies began now they would be suspected to be related, though from observation we know Onyx was born to L32 Olympia. As a result, Granny could be much younger - or even much older - than estimated. 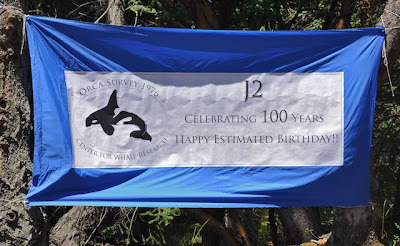 I've heard them say to assume it's plus or minus 10 years from 1911, but the gap could be even greater, just adding to the mystery of this iconic whale. Right after Ken Balcomb's speech, the whales started to be seen in the distance, as if arriving fashionably late to the party. It was even J-Pod, an almost perfect scripted time for them to show up, except for the fact that J-Pod has been splitting a lot lately and J2 Granny's group was several miles away. Still, the more than hundred people gathered on the shoreline were thrilled to watch this group of whales go by. Since I recently wrote a blog post and put together a photo gallery for J1 Ruffles, who has been missing since last November, it only seemed appropriate to do the same for his female counterpart, J2 Granny. 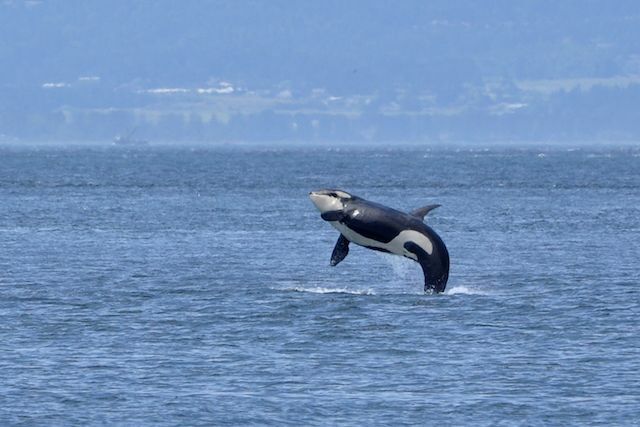 Whether or not she is really turning 100 years old this year, Granny is a special whale who has undoubtedly lived through a lot in local waters. She was alive before we humans knew anything about killer whales, back when fishermen and even the Navy would shoot at orcas or use them for target practice. 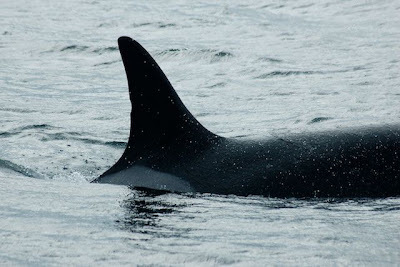 She lived through the capture era, when she was netted up along with the rest of her pod while dozens of her family members were taken into captivity or killed during the capture process. She has seen the local salmon fisheries be over-fished and decline over the course of decades, and watched the boom of the fishing fleet, and its subsequent dwindling. 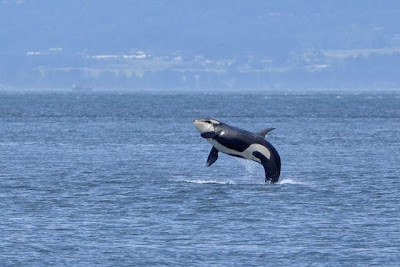 She has seen the human attitude shift from one of harmful misunderstanding to one of such overzealous fascination that she and her family now have their own daily paparazzi in the form of whale-watching boats that follow them around from dawn to dusk during the summer months. One has to wonder what she makes of it all - more than any other whale, how I would love to be able to have a conversation with Granny. In reality, Granny is probably less consumed with our human affairs than the daily goings-on of her pod. It is unusual to find any species where animals live long after being reproductive; in cases where they do they are still contributing some valuable resource to the collective population. 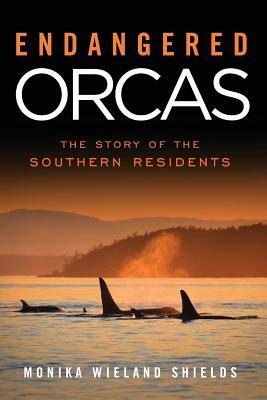 Killer whales are one such example where females can live long beyond their reproductive years. While they may play an important grandmothering role to their grandchildren and other distant descendents, it is also theorized that they carry important cultural knowledge for the pod. 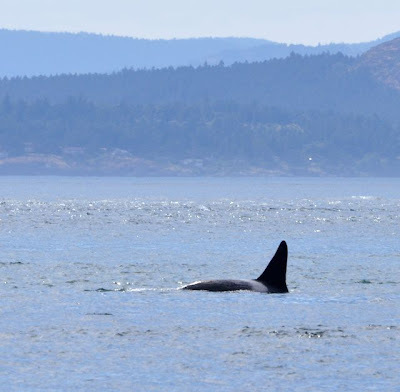 With J2 Granny often out in front when J-Pod travels, it's easy to speculate that perhaps she is their leader, knowing where to travel during different seasons and in different conditions in order to find enough fish for her family. 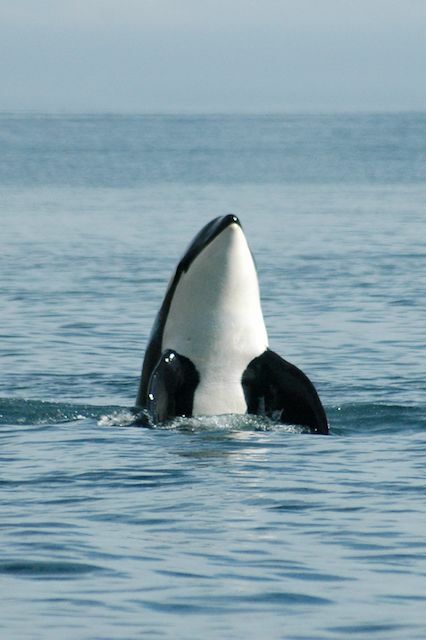 Senescence doesn't occur with killer whales like it does with humans. Granny still must keep up with her pod on a daily basis, which means swimming up to a hundred miles in a 24 hours period. Not only that, but she is still seen tail slapping, breaching, cartwheeling, and spyhopping - a state of activity you don't associate with many 100 year-old humans. She has always been a special whale to me, not just because of her amazing story, but because I had a memorable encounter with her early on in my days of whale-watching in the San Juan Islands. 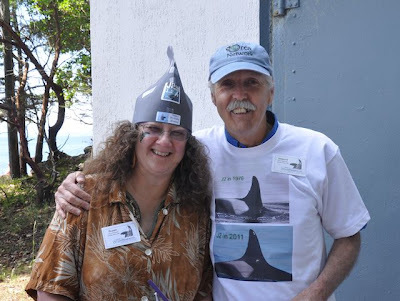 The first time I ever saw a whale swimming through the kelp beds right off the shore of Lime Kiln Point State Park, just feet from me sitting on the rocky shoreline, it was J2 Granny - it is a moment I will never forget, and one that helped seal my fate of having my heart forever tied to the San Juan Islands. I've paid tribute to Granny in various ways over the years: by painting her as part of the mural on my wall, and by designing the tattoo I got on my shoulder as an 18 year-old in her likeness. Now I've also written this blog post, and created this photo gallery with 12 of my favorite photos of her. 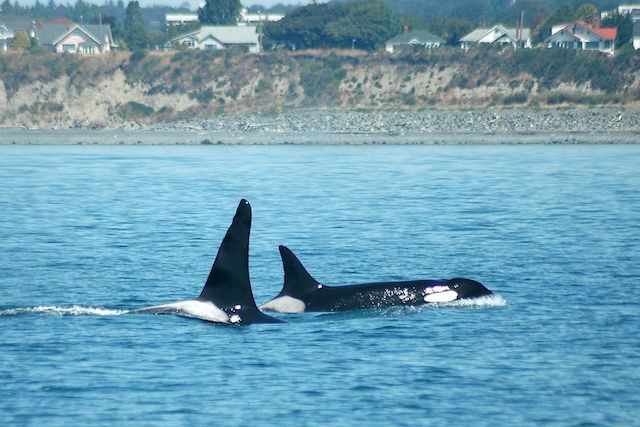 It was always hard to imagine a J-Pod without J1 and J2, and indeed it feels like there is a presence missing without Ruffles there this year. I know Granny's day will come at some point, as it must, but I hope to be able to watch her swimming past the west side of San Juan Island for years to come, just as I have for years in the past. I would love to see ANY human tail- slap or spyhop, let alone a 100-year-old. Great tribute, Monika!